My current pizza project has started with a number of familiar cities, but this week I ventured into unknown territory at the recommendation of my cousin Dawn. She informed me that Milwaukee is known for their bratwurst, beer and cheese. In my research I learned that Milwaukee has a large population of people with German ancestry. Fred Usinger, a German sausage maker, immigrated to Milwaukee in the 1870s and within a short time began operation of his own sausage company on Third Street. Over 140 years later, the Usinger name is still associated with bratwurst. Knowing that beer is another staple in Milwaukee, I bought bratwurst that was poached in beer and Fontina cheese, produced by BelGioioso of Wisconsin. I sliced the brats and browned them in a pan. To go with the beer brats I used sauerkraut (which we were a little hesitant about) and jazzed it up by adding sauteed onion and chopped apple. 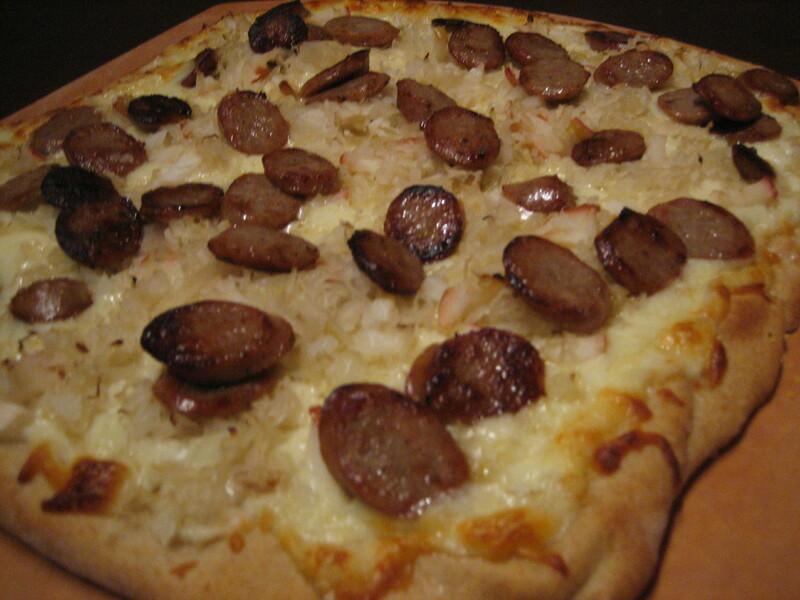 I sprinkled the Fontina cheese on the dough, added the sauerkraut mixture and lastly the bratwurst. Andrew and I have been pleasantly surprised in the past when I have added unfamiliar items to our pizzas. Today was no exception. The beer brats had a great flavor that complimented the cheese and the sauerkraut flavors incredibly well. We loved this pizza! Thank you Milwaukee for some new and delicious ingredients for our pizza.